So many of us greet the holiday season with a poinsettia in our home. 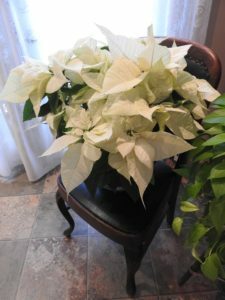 This most popular Christmas plant brings instant beauty. The colours are limitless thanks to science and devoted botanists. No longer just red, we have choices of pink, white, cream, burgundy, variegated white and red or pink and red. Proper care begins with bringing your plant home. Poinsettias may be popular in the winter but they cannot stand freezing temperatures. In the walk from the store to the car, be sure to wrap your plant in paper or a plastic bag. A good store will provide you with cold protection. Choose a bright room in the house for your new poinsettia but do not place it in direct light. Remove the decorative wrapping which looks pretty but hinders proper air flow and water drainage. Keep the soil slightly moist. Watering will depend heavily on your home’s climate. If the leaves are turning yellow, your soil is too wet. Only water when the soil surface has dried out. If the leaves are wilting, you may have exposed it to too much cold during transport from store to home. Wilting leaves can also be a sign of a draft, either warm or cold. Keep the plant away from vents or drafty windows. Finally, poinsettias have a bit of a bad reputation with many folks thinking they’re poisonous. They are mildly toxic but unless you are legitimately allergic to the plant, the most you’ll face is a bit of a stomach ache. If you are worried about kids and pets, simply move them out of reach. Enjoy this wonderful season and don’t forget to bring some poinsettia beauty to your home or the home of a loved one! For more gardening information check out http://www.dunnvillehortandgardenclub.org/. We resume our monthly meetings Jan. 18, 2018.